Halloween is my absolute favorite holiday. There is something about the darkness and mystery of Halloween that gets my creativity flowing. For those of you who may have missed my tutorial over at The CSI Project last week, I just wanted to share a fun Halloween Project with you! 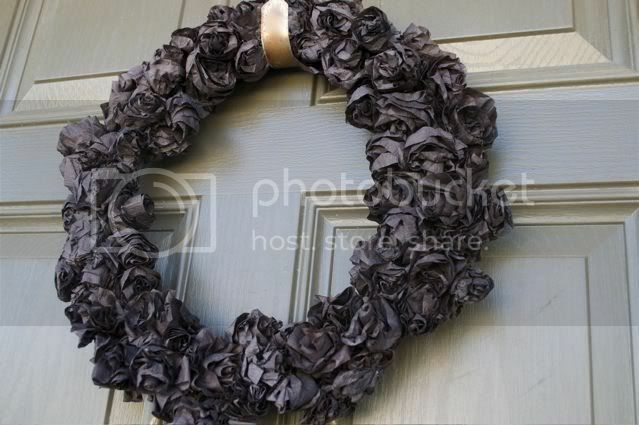 The supply list is simple (and cheap): A Wreath Form, Black Crepe Paper, and Hot Glue - that's it! 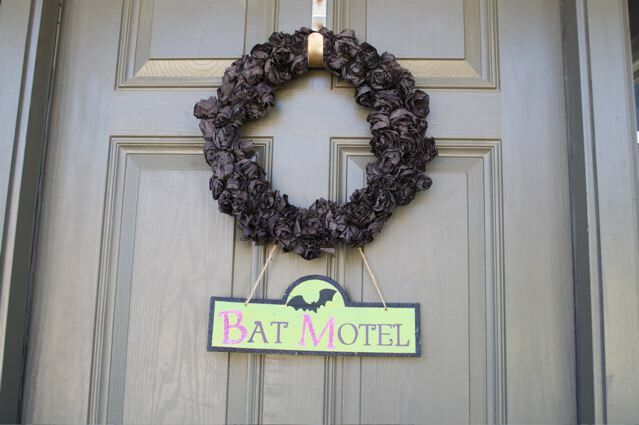 You can also add a little sign, or any other embellishments, to make it your own. 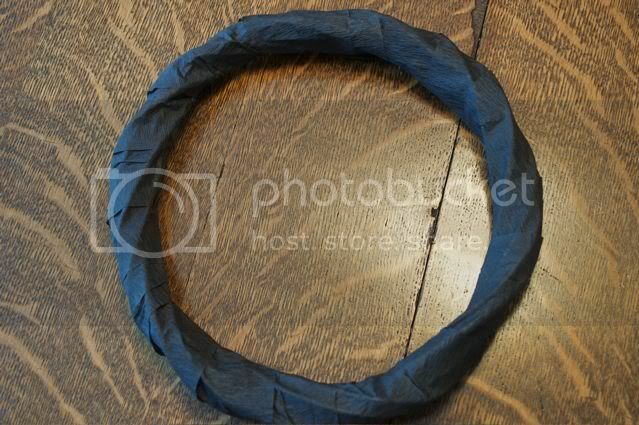 Cut a long piece of crepe paper and wrap it around the wreath form. 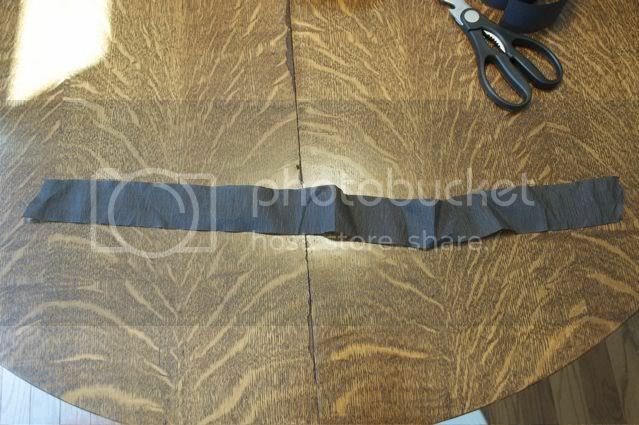 To make sure it stays in place, add a dot of hot glue to the beginning and end of the wrap. To make the flowers, cut 24" strips of crepe paper - there is no set amount that you will need - I cut a bunch in the beginning to have them ready, and then just added as I went. 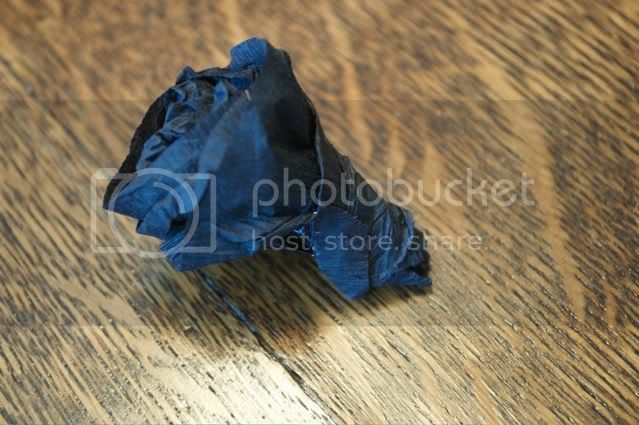 Start out by crumpling up the end of the paper, and then begin wrapping it around itself - twisting the bottom as you go. 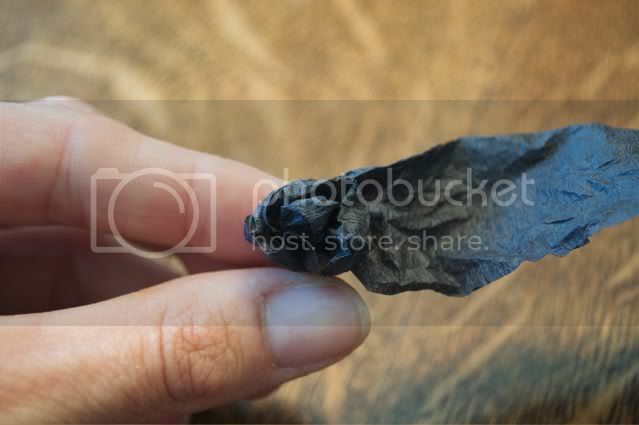 You will end up making a pointed end at the bottom. 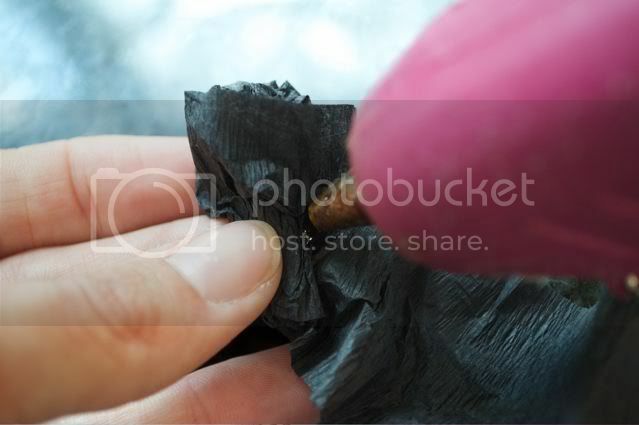 Dab a dob of hot glue at the base to secure the paper as you wind. I glued mine about every 2 times around. 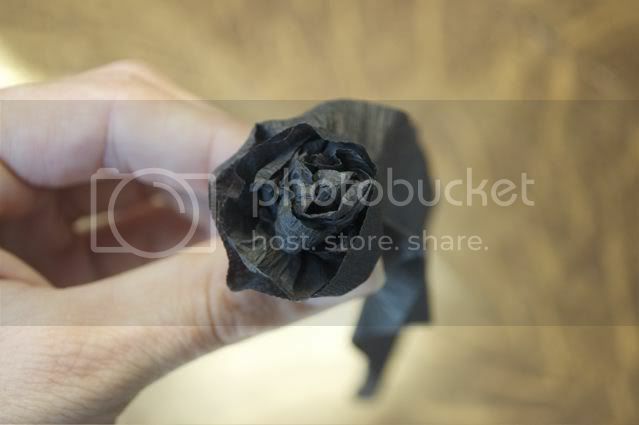 Then, just keep on going around and around, gluing as you go until you have formed a flower. 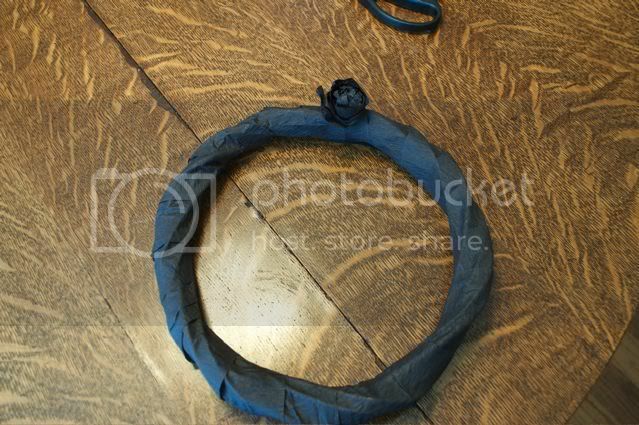 Finally, just start gluing all of your flowers to the wrapped wreath form. Try to keep them close together, and stagger them if possible so that it looks filled in. That way, all of the flowers aren't lined up in a row. When you are done, it looks like this! To add something fun to the base of the wreath, I used floral wire to add a sign. 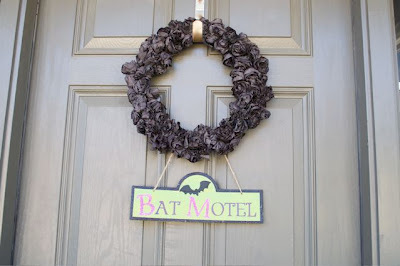 I bought this one at Dollar Tree last year, but you could also add a homemade one as well! I hope you enjoyed my tutorial! Happy haunting everyone! Posted by Jennifer at 9:45 AM 0 I would love to hear from you! Friday I'm in Love...with Brights! Lately I have had an obsession with bright turquoise and yellow. I am actually thinking of using it in the baby's room, so it must be on the brain. Needless to say, that was what I was drawn to this week. I am really loving all of these picks - the collection of them kind of reminds me of a beautiful Etsy Treasury! This first project is so gorgeous and unexpected - I love it! 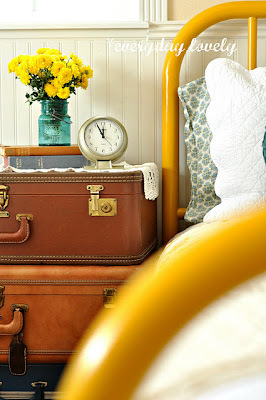 Cailan from Everyday Lovely found this iron bed (which started out looking completely different) at a flea market for $40. She decided to paint it with a sunny coat of yellow, and it turned out just beautifully! 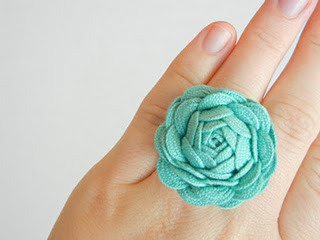 Shirley from I "Shir" Can Craft shared a tutorial for how to make these amazing Ric Rac Roses! 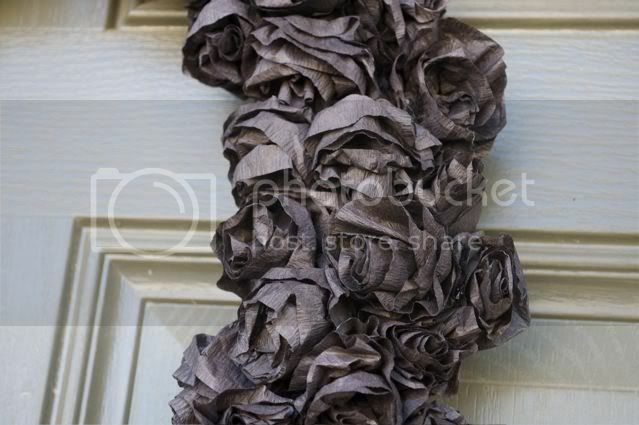 These would be awesome as embellishments for anything - rings, necklaces, headbands, pillows! You name it - I am inspired, and this has been pinned to my Things I Want To Make board. Thanks for sharing the tute Shirley!! 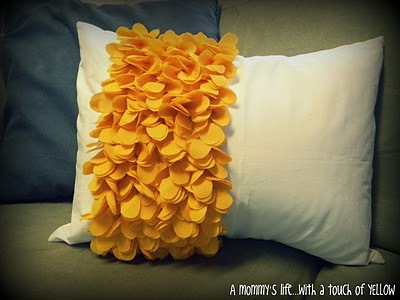 I couldn't resist this Flower Petal Pillow from A Mommy's Life...With a Touch of Yellow. 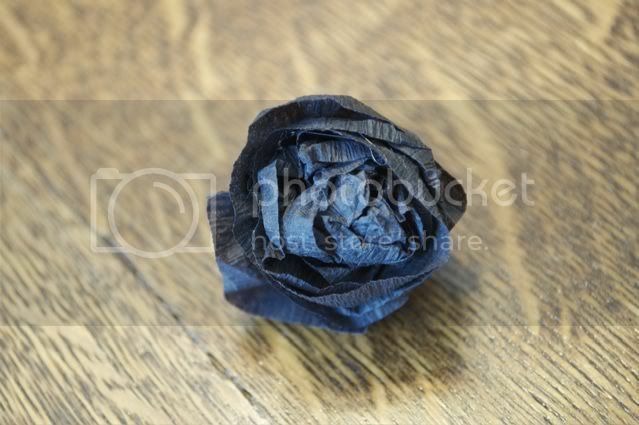 Whitney shared the tutorial on her blog as well - I have been wanting to find out how to make these Flower Petals forever! Isn't it gorgeous?? I may have to bust out the sewing machine for this one! 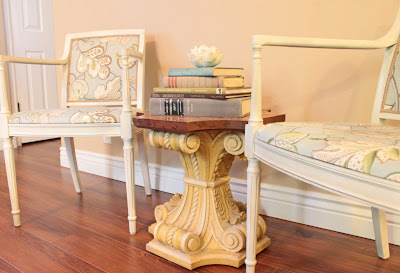 It always amazes me when people have the guts to paint furniture. 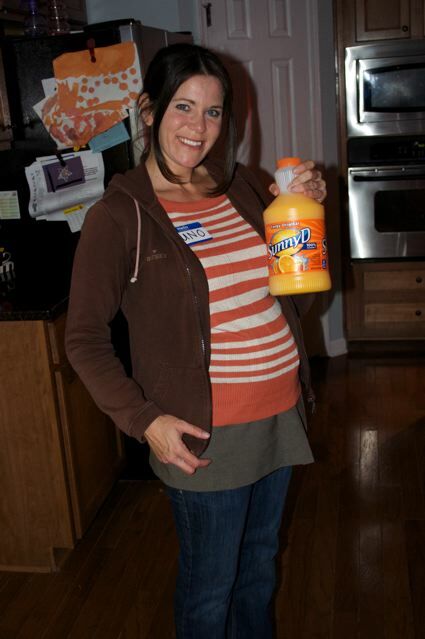 I haven't found the courage yet, but Stacy from Not Just a Housewife did just that! I guess it helps that she found the chair for $5 - I think Hubby would kill me if I painted my dining room chairs! LOL. 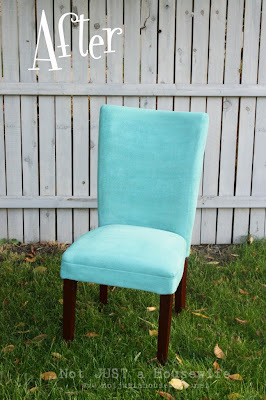 This chair came out so awesome - I love the bright color!! These Felt Flowers are so cool! I have seen these around, but never knew how to make them...until now. 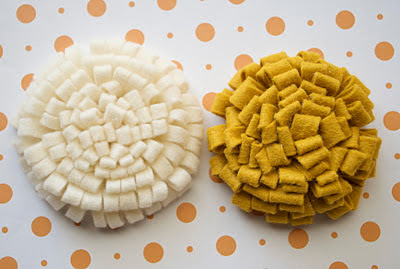 Crystal from A Pumpkin and a Princess gives a step by step tutorial - I may be running out to buy some felt in the very near future!! 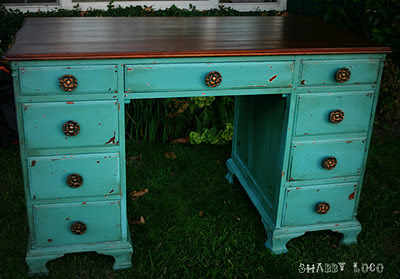 And finally, I absolutely fell in love with this Executive Desk Makeover from Melissa at Shabby Loco! How nice would it be to walk into your home office and see this everyday? It would definitely make me smile all the time! I hope my favorites were a bright spot in your week! If you were featured, feel free to grab a button from my sidebar. Have a great weekend everyone!! 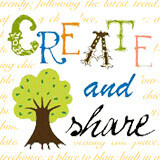 Posted by Jennifer at 7:41 AM 3 I would love to hear from you! 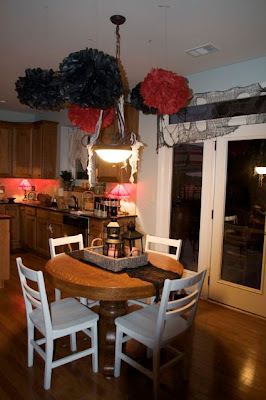 I love Halloween - so much so that for the past three years, we have hosted a Halloween party. Now, it's become sort of an annual thing. This year, when planning my video invitation, I decided on a Blair Witch theme. 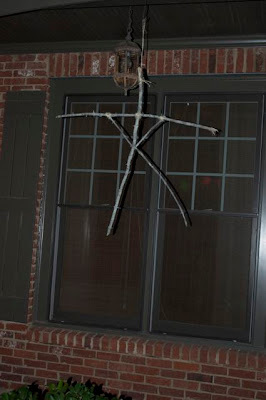 I wanted to "re-create" the apology scene from The Blair Witch Project - and yes...I am going to share it with you. PLEASE don't judge my acting skills, LOL!!! (I cannot believe this is the first video I am going to post)! 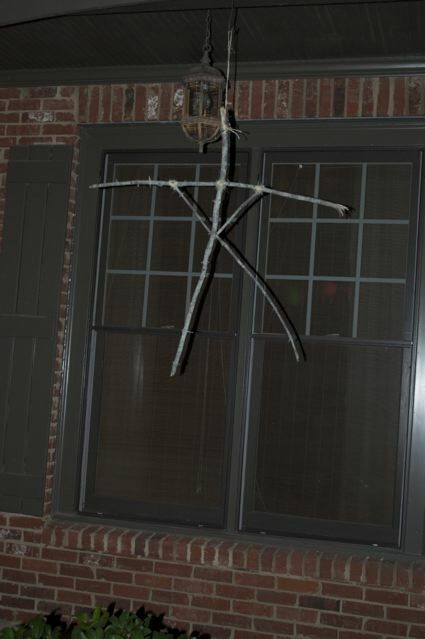 So, in keeping with the theme, I knew I wanted to make some of those scary stick figures to hang from my front porch. 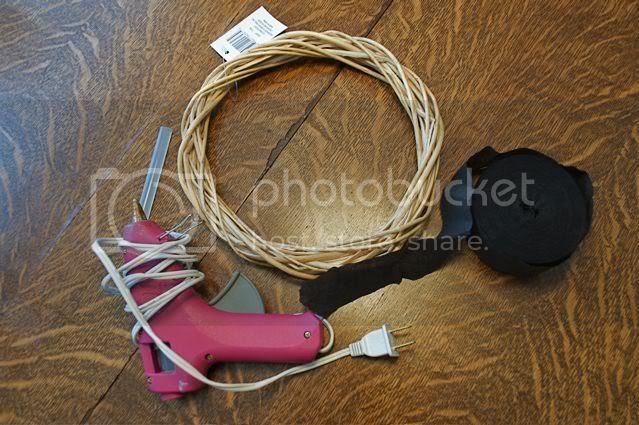 Making these was actually fun - they were super easy to replicate with some sticks, twine and a little hot glue. I actually spray painted them with glow in the dark paint, but with the flash (and the street light) it it kind of hard to see in this pic. 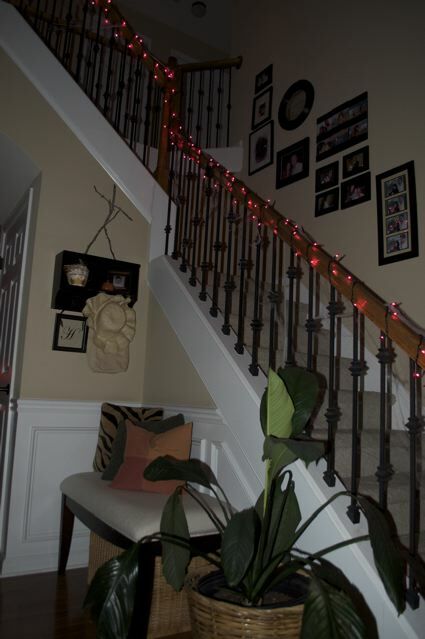 When you walked into the entrance, we had purple lights going up the staircase with spider webs in the spindles. I apologize for the pictures - I had to take them in the dark, so they aren't the best. To the left of our staircase is our dining room, where we set up the food every year. 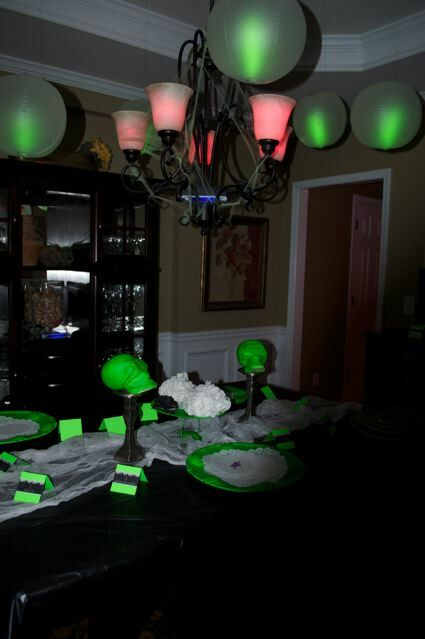 I decided to go glow in the dark this year, and spray painted everything I could with some fluorescent green spray paint. Then, with fishing line, I hung glow in the dark beach balls from the ceiling, which looked like they were floating in mid air. Since all of our guests were bringing a dish, I made food labels for everyone to put in front of their dish. That way, all of our guests could vote on the best tasting and best display. People went all out on their dishes - they did such a fantastic job!! This was a dish I made - Shriveled Potatoes with Romesco Sauce - ala Martha Stewart! 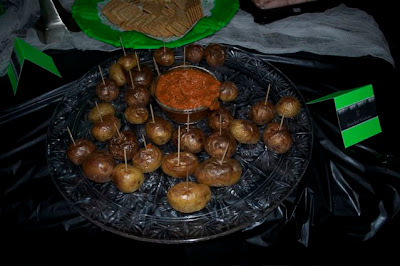 My friend Ginger (from The Savvy Shanty) made these Morning After Eyeballs!! Another guest brought these awesome Witches Finger cookies. So cool looking! Then, my two favorites. 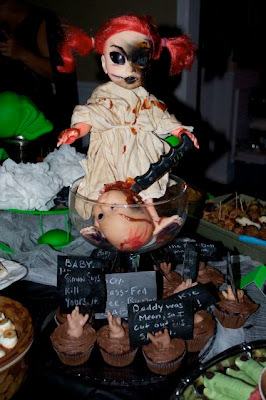 The first was a cupcake display called "Baby Cakes". 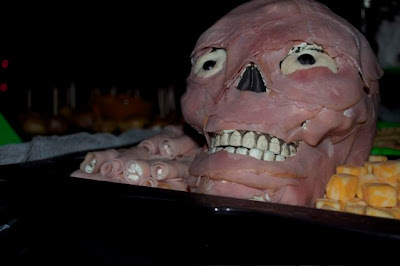 Too creepy, right? And finally the winner of the Best Display....The Prosciutto Ham Head! So gross! The rest of the house was decorated as well - it took me hours to get it all done! Here's some shots of the Kitchen, Bath Room, and of course, my Halloween Mantle. Sneak Peak of my costume, can you guess who I was?? And finally, after many weeks of deciding, I decided to play up the baby bump and go as Juno - complete with the Sunny D! We had a blast at the party! 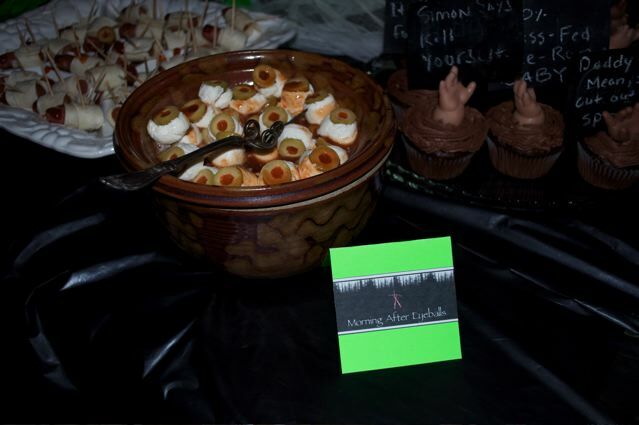 Everyone looked amazing, and it was a huge success. It was a lot of work (which is one reason I have been so MIA), but worth it! I already have ideas brewing for next year!! Posted by Jennifer at 7:43 AM 0 I would love to hear from you! It is Friday once again, and boy did I find some great projects to share this week!! With the arrival of the very cold weather over the past few days, I have home on the mind. How can I spruce up the one I've got since I'm about to be stuck inside for winter hibernation!?! Here's some good ideas (including 3 high end knockoffs!) to get some creativity flowing!! I was literally giddy looking at these, and all have been pinned to make in the future! Cue the singing angels... "Halleluiah, Halleluih!" This Rustic Pallet Bench at Our Vintage Home Love can come to my home love any day!! I have a pile of pallets sitting in the garage (yes, they are still there), and I think I may have found a winner. I have just recently stumbled upon Diana's blog, and I think I'm hooked. Now I would like to introduce you to Ms. Ballard Chair Knockoff by The Rooster and the Hen. I seriously think this version is better than the original! How gorgeous - the colors, the fabric. Swoon!! 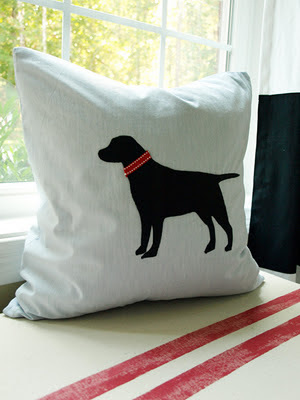 I saw the original doggie pillow in the Restoration Hardward Baby & Child catalog, and loved it - but Julie's version at Less-Than-Perfect Life of Bliss was so perfect! She shares a tutorial - head on over there to check it out! This would be so cute in the nursery (if it's a boy)! 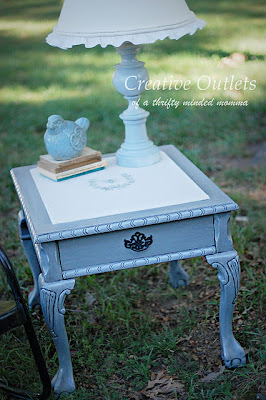 Katie over at Creative Outlets outdid herself with this table! 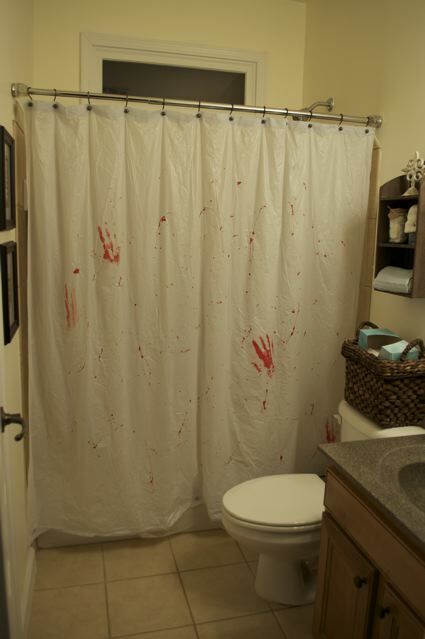 I love the addition of the printed drop cloth - so different!! The color is great too - hmm - another good color for a baby boy's room. OK - sorry, I have baby on the brain (the little bean is moving around right now, can't help it)! 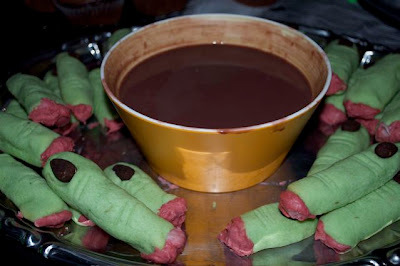 And finally, I bring you the last knock off - something I am now DYING to make! 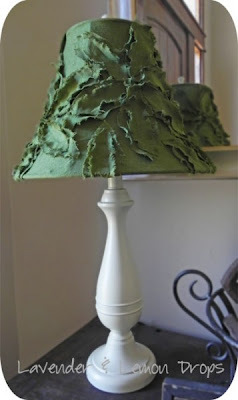 How awesome is this replica of an Anthropologie lamp shade? Erin at Lavender and Lemon Drops did such an amazing job with this - AND no sewing required!! If you were featured, feel free to grab a button from my sidebar! Have a great weekend! 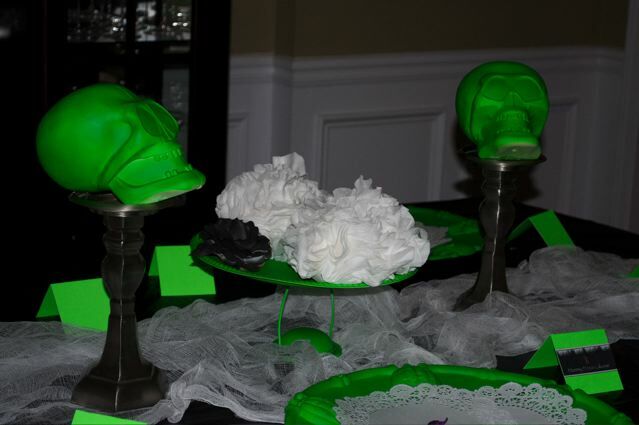 We have our huge annual Halloween Party tomorrow, so I have lots of projects to finish up - can't wait to share them! Posted by Jennifer at 8:21 AM 5 I would love to hear from you! 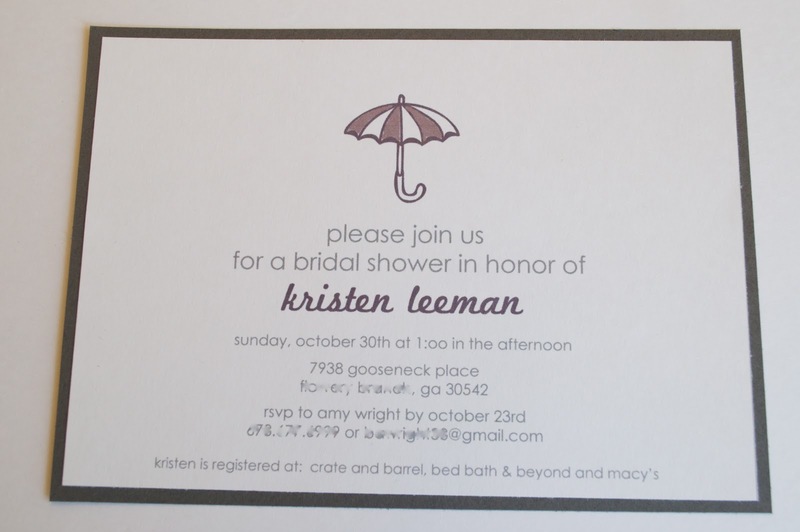 A few weeks ago I had a client call on a Friday and ask if I could make some bridal shower invitations for her. The only catch was that she needed them quick, like, by Monday. To be honest, I didn't even have to think about it - it had been so long since I had made invitations that I jumped at the chance. 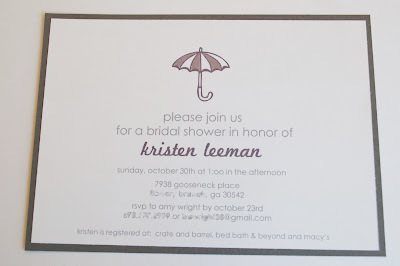 I asked her the color scheme, and what style the bride liked, and she gave me free reign to design whatever I wanted! LOVE those types of orders! I decided to take time during my lunch break to get a jump start on two designs (I love giving options if I can). To my surprise, I was on a creative roll, and had both designs done in an hour. Wow! 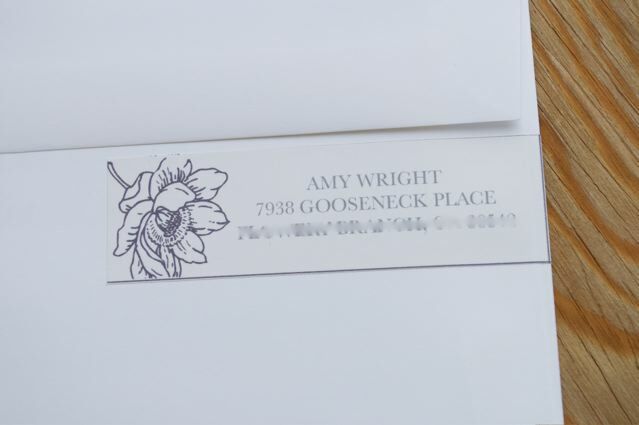 This was the one that she chose, and I also design custom wrap around labels for her to place on the envelopes. 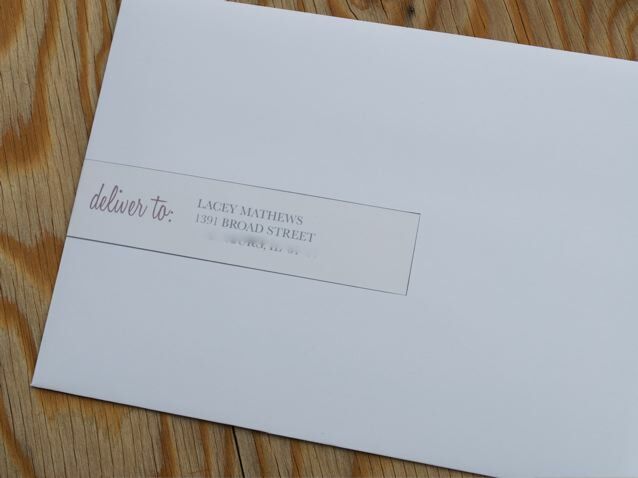 I always give my clients this option - I personally detest hand addressing envelopes - the easier the better right? 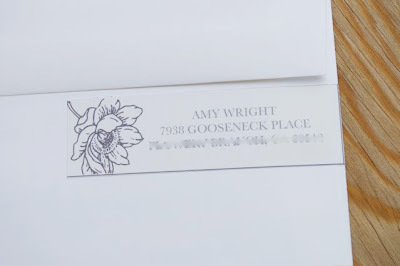 All she literally had to do was seal the envelopes, slap a stamp on them and toss them in the mailbox! I have blurred out important contact information in order to keep it confidential. This was the design she chose! And this was the other design option I gave - cute, right? She was really happy with them - and so was I! 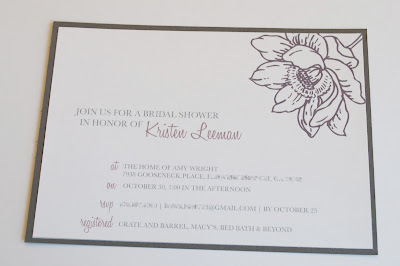 I busted out 2 great designs and hand made 23 invites in 2 days - not bad! I was literally jones-ing to make these. There is something about feeling the paper in my hands, and seeing the final design result that just gets me charged. Fun!! Posted by Jennifer at 7:58 AM 0 I would love to hear from you! Happy Tuesday!! It's Halloween Week over at The CSI Project, and I just wanted to let you all know that I am guest posting over there today! 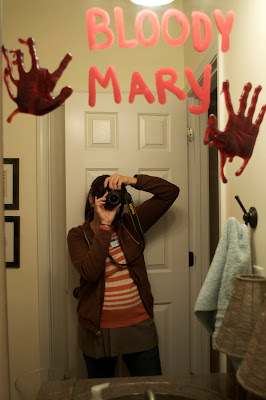 Make sure you head over to check out my goulishly good Halloween project tutorial!! 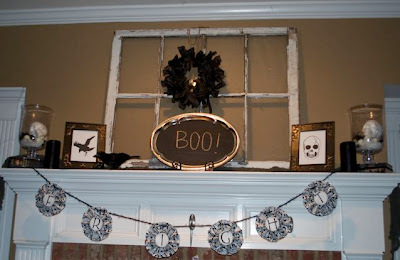 On Thursday you can link up your spooky projects too!! Posted by Jennifer at 8:17 AM 0 I would love to hear from you! I am a mom of two, work full time, and in my spare time – love to create! I will get my hands into just about anything – home decor, upcycled jewelry and my absolute favorite, paper crafting! Thanks for stopping by!